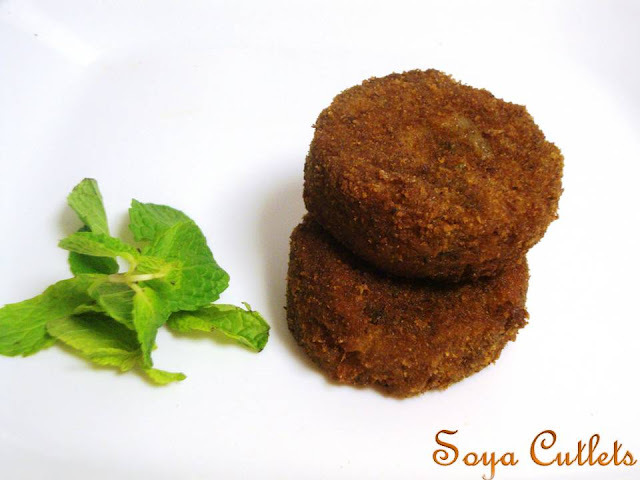 Here is an excellent way to sneak in protein and calcium packed soya chunks in your diet in the form of healthy & delicious Soya Cutlets - as a snack or an appetizer! Soya chunks are processed from soyabeans that make them more digestible and palatable. They are a rich source of vegetarian protein, vitamin A, vitamin B12 and iron also serves as a great substitute for meat. Soak soya chunks in water for nearly 20 minutes or till it becomes soft. After that squeeze the excess water. Wash at least 2 to 3 times and squeeze completely. Mince that using mixer / blender and keep aside. Then, add grounded paste; Saute for a minute and add the minced soya chunks along with all the spice powders and salt. Mix well. add little breadcrumbs to reduce the water content in the potato soya mixture, if needed). Add veggies like carrot, peas, etc., to increase the nutritive value. Delicious snack... Very filling too.. Healthy n perfectly made.U have a nice blog. I am so glad that you made that cutlet and also loved it. Thank you so much Latha Prabakar. Thank you solai for trying my recipe and glad you liked that too. Amazing! Thanks for sharing this recipe in easy way!